NEXO announced the ISE Europe launch of the GEO M10 line array. The new high-output sound reinforcement system has been developed for long-throw theater and live music applications. The GEO M10 system is a powerful package and twice as powerful as its sister GEO M6 compact line array launched two years ago. While the M10 maintains a similar design, the larger M10 cabinet draws on structural and acoustic innovations first released in the groundbreaking NEXO STM Series modular line array, particularly the STM M28. There are two versions of the M10 cabinet, offering 12.5° and 25° of vertical dispersion. Both have 80°/120° horizontal dispersion which can be configured manually by removing the magnetic grill and adjusting the company’s innovative flange fixing system. The M10 enclosure has been named such for its single 10” neodymium LF driver, paired with a 1.4” HF titanium diaphragm HF driver. The 2-way passive module will deliver a frequency response of 59Hz-20kHz and nominal peak SPL of 131dB. There are several advantages to the use of a single 10” driver; a much lower frequency response from a 2-way cabinet; and the cabinet’s narrow profile and height provides for tighter inter-cabinet angles. 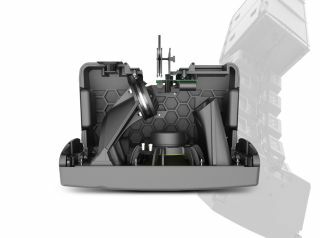 The M10 weighs just 46 lbs., and its compact dimensions mean minimal visual impact and improved sightlines, important for theaters, auditoriums, and corporate conference venues. The sub-bass cabinet for the M10 is the MSUB15. Weighing 79 lbs., the new sub is a housed in either a sturdy touring package with steel grille or the installation version featuring a cloth grill. The MSUB15 has large composite bumpers on each corner, and side handles and flies with the M10 in a very low profile array, operable in Omni or cardioid mode. The MSUB15s are the same width as the M10 cabinets but taller. Two subs are equivalent in height to three M10s. M10 can be flown or ground-stacked, with or without the MSUB15. Up to 12 M10 or 8 MSUB15 modules can be combined in a single flown column, or, for instance, 3x MSub15s can be arrayed above 9 M10 cabinets, using one of two dedicated bumper accessories. Or, the M10 can be ground-stacked on top of the MSUB15s, with between -12° to +12° of tilt. The rigging system for the GEO M10 features a similar design to the GEO M6 and the STM Series. The internal 3-point rigging system now features automatic locking and no loose parts. Two different bumper options are available, both with optional expansion bar or an extension accessory for ground stacking. Highly cost-effective amplification is via NEXO’s NXAMP4x4 TDcontroller; with up to four M10 cabinets per channel, and up to three MSUB15 per channel. The system can be controlled over a network using a Dante, Ethersound or AES/EBU digital expansion card.